Now that the market has had a day to digest Google’s ambitious $12.5 billion bid for Motorola Mobility Holdings, Inc., what do they think? Ewww. 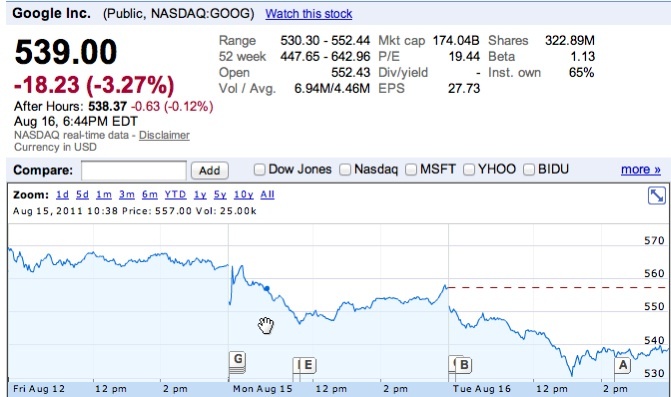 At least analysts are still behind the stock…oh. Screw those S&P bastards anyway. They downgraded our country’s debt rating for the first time in history. WHY DO THEY HATE AMERICA?! Another person you don’t hear from on the acquisition: Eric Schmidt. I wonder how he feels about the kids busting into the liquor cabinet 10 minutes after he left. He should have marked the bottles. HTC Digs in Couch Cushions, Finds Some More Patents to Throw at Apple I’m Going to Disneyland!